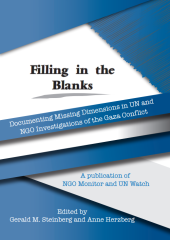 This report provides, in parallel to the report of the UN Human Rights Council’s Commission of Inquiry on Gaza (the “COI” or “Commission”), independent, fully-sourced, systematic, and detailed documentation on some of the key issues related to the outbreak of intense conflict between Hamas and Israel during July and August 2014. Based on past UNHRC investigative commissions regarding Israel, in which the facts related to central dimensions of the conflict were omitted, a group of experts was assembled to provide the missing information and analysis. 1) The production and import of rockets and missiles, which were then launched from Gaza at targets in Israel, in violation of international law: This section documents evidence on the transfer of rockets and components from Iran, via sea and land routes, as well as the use of materials and facilities in Gaza for producing such weapons. In the period since 2001, more than 20,000 projectiles have been launched from Gaza, targeting the Israeli civilian population in a gradually increasing radius. The import, production, storage (in densely populated civilian areas), and launch of these weapons clearly and repeatedly violate international law. 2) The sources of Hamas financing in light of international law forbidding the provision of assistance to terror organizations: Hamas is widely recognized as a terror organization, and as such, providing financing is a violation of international law. In this chapter, we examine the internal and external funding mechanisms of Hamas, with a particular emphasis on states that provide financial, military, and material support – specifically Syria, Iran, and, after 2012, Qatar and Turkey. 3) Evidence regarding the abuse of humanitarian aid provided by different sources — international agencies, individual governmental, and non-governmental aid groups — to Gaza; the diversion of aid for military and terror purposes; questions of supervision and accountability by aid providers; and the international law implications of the diversion of aid. By acquiescing in the large-scale diversion of such aid to military and terror objectives, the providers of this aid, including governments and humanitarian organizations, share responsibility for the violent attacks and their deadly outcomes. 4) The credibility of reports and allegations from non-governmental organizations (NGOs) regarding the 2014 conflict: In this, as in many other, conflicts, NGOs that claim to promote universal human rights, international law, and similar principles, repeatedly and consistently made claims that were highly selective, unsubstantiated, or clearly false. Many of these groups, which enjoy a high level of visibility and prestige, produce highly biased “reports” and draw conclusions without any professional fact-finding methodology, often based on selected “testimonies” that are unverifiable and contradictory. Nevertheless, in previous publications from the UNHRC, including the 2009 Goldstone Report on Gaza, publications from unsubstantiated and tendentious NGOs, often repeated by UN-OCHA or journalists, are cited as “evidence” and their legal conclusions are repeated. In this section, the biases, lack of professionalism, and methodological failures of the NGO network are documented in detail. The continued failure by HRC fact-finding mechanisms to employ clear benchmarks for ethical standards vis-à-vis its relations with NGOs, as well as their lack of adherence to the principles of transparency, objectivity, non-selectivity, balance, and universality, are among the reasons for the HRC’s unsuccessful first eight years and the sweeping criticism of the 2009 Goldstone Report, among others. In some cases, their findings and conclusions have been manifestly dangerous and have contributed to civilian harm, bolstering the impunity of groups like ISIS, the Taliban, Hamas, Hezbollah, and Boko Haram. At a minimum, and in order to avoid, the gross failures of the past, future UN commissions of inquiry must move beyond the simplistic narrative of sole Palestinian victimhood and complete Israeli wrong-doing. They must end their practice of one-sided mandates and examine the motivations and actions of Hamas and other Palestinian armed groups, as well as their supporters and funders. Future commissions must adopt and strictly adhere to internationally-accepted fact-finding standards, in particular the principles of impartiality and objectivity. They must also be fully transparent in all methods of their work including, identifying all staffers and consultants, adopting standards governing all interactions with NGOs, and implementing guidelines as to how the credibility and factual claims of NGOs will be assessed. Without these key reforms, UN fact-finding mechanisms will continue to be viewed as politicized exercises of little relevance.